Do you want to change the appearance of emails sent by your WordPress site? By default, all email notices sent by WordPress are in plain text and quite dull. 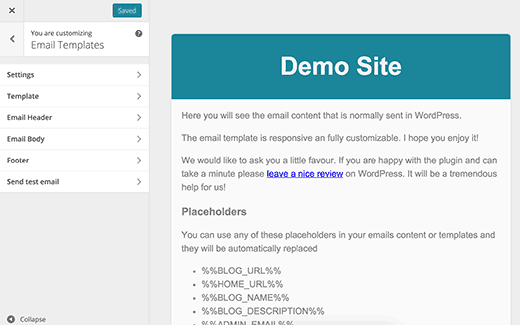 In this article, we will show you how to add beautiful email templates in WordPress for all outgoing WordPress messages. 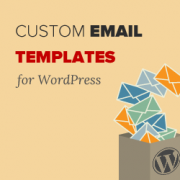 Why Use Email Templates in WordPress? By default, WordPress sends various different email notifications. If you run a single author WordPress blog, then you can probably do without using any email templates. However, if you run a multi-author site, membership site, or an eCommerce store, then you may want to consider improving your email layout. 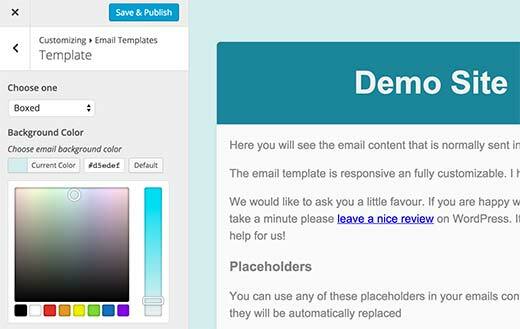 Using colorful HTML templates for your emails provide a better user experience for your users. Also when you use your brand logo and colors, it makes your emails look more professional and aesthetically pleasing. 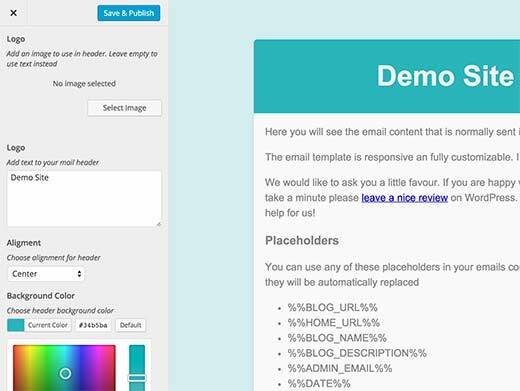 Let’s take a look at how to add beautiful HTML email templates in WordPress. First thing you need to do is install and activate the Email Templates plugin. Upon activation, simply go to Appearance » Email Templates to create and modify your email templates. 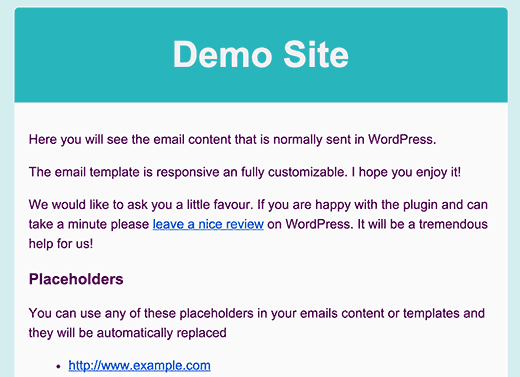 Email Templates plugin uses the WordPress customizer which allows you to create your own beautiful templates with live preview. The customizer has different sections. First you need to click on the settings tab where you can enter your site’s name and the email address to use in the from field of outgoing messages. By default, the plugin will use the email address defined in WordPress settings. However you can change that to use any other email address. Next, click on the back arrow to return to template sections. Under the template tab, you can select whether you want to use full width template or the boxed layout. You can also choose a background color. 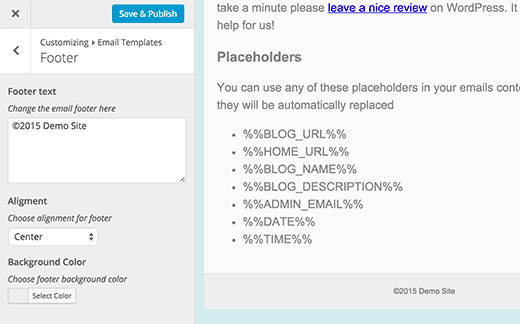 Once done, click on the header section to setup the header of your email template. You can add a logo or use text. By default, the plugin will show your site’s name as text in the email header. You can change that to whatever you like. You can also change font size, header text and background colors. Under the email body section, you can change the font size and colors of the email template. One thing missing from this section is the ability to change the color of links. Hopefully this will be added in a future a version of the plugin. Lastly, don’t ignore the footer section of your email. By default the plugin will show your site’s name with the copyright sign. You can customize it to your desire. You can also change font, background and text colors. 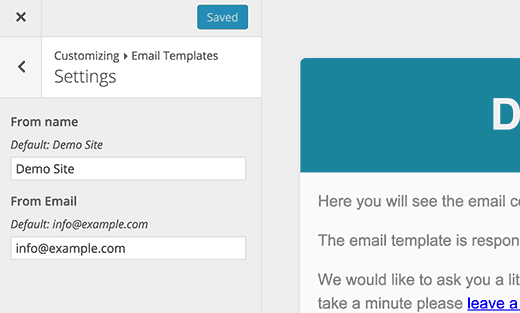 Once you are done designing your email template, you need to click on the save button to store your settings. 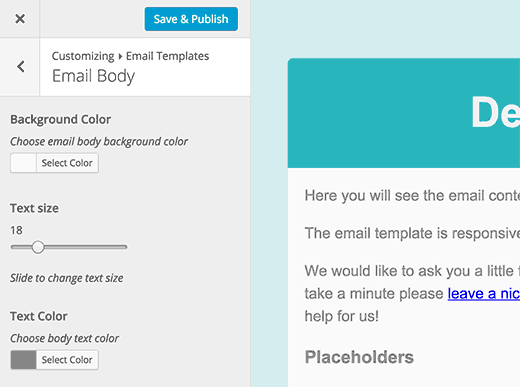 After that, click on the send test email tab to see a preview of your email template. The plugin will also send an email to the admin address in your WordPress settings. If you are not receiving emails from your WordPress website, then you may want to follow the instructions in our tutorial on how to fix WordPress not sending emails issue. Email Templates plugin does not affect emails sent by third party email marketing services. For that, you will have to design your emails using the tools offered by the email service provider. Most email service providers like Constant Contact and AWeber has templates that you can use. See our article on how to add email subscriptions to your WordPress blog. 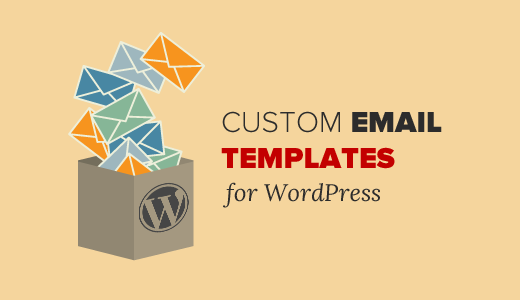 We hope this article helped you add beautiful email templates to use in WordPress. You may also want to see our guide on how to add email this option to your WordPress posts. Hi, thank you for this useful tutorial. I have a question: With this plugin when I write a new post, would it show the full content of the post? or just an excerpt? i am having an issue after installing this plugin, there is another extra email with no subject / no body arriving with the correct ones. any idea why ? Hi guys, we have not just one email channel which is going out. and so on. How do I build for each of this email notifications a different template and integrate it in the process? Hey, thanks for the helpful article and very easy to use plugin. Only thing I couldn’t see was how to change the link colour. Otherwise it’s great! We don’t understand. Can you please explain what you mean by ‘activate it the email link’? I thought you did not recommend using the WordPress email tool and suggested we use a 3rd party product like Mailchimp. We still do. This plugin does not manage your email subscriptions it only creates templates for system emails sent by WordPress. Thanks for the info. When I go to Appearance – the only choices I have are themes, customize, widgets, menus, widget area, and editor. I do not have Email Templates as an option here. Is there somewhere else I can access it? Thanks. Hi Karrie did you install the Email templates plugin? Do you have WordPress version 4 or above?